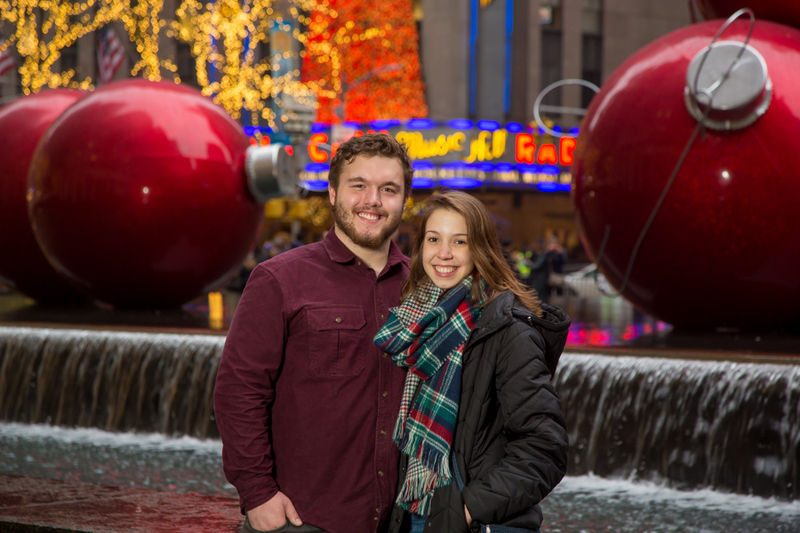 Portraits at Rockefeller Center ? 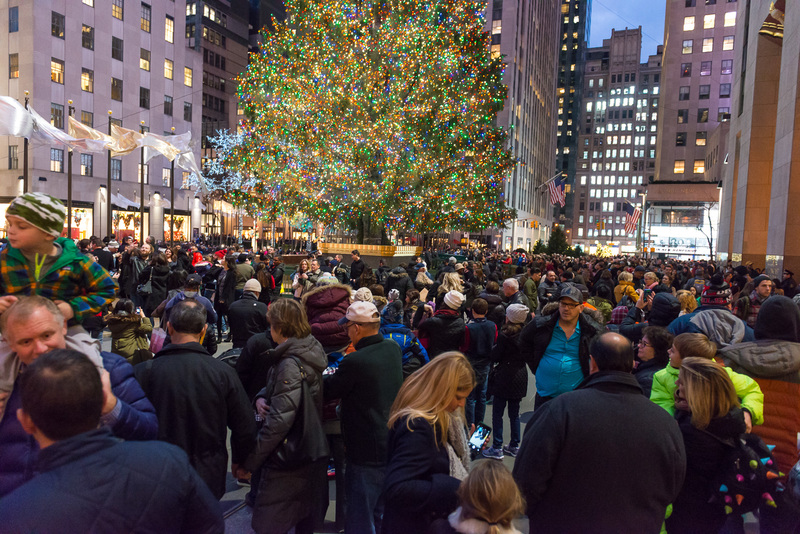 Has anyone shot at Rockefeller Center during Christmas time? If so, besides the obvious fighting of crowds, does anyone know the official rules? I have to shoot a couple right before Christmas. Basically a couple of shots and thats it. I know in Neil's latest book, he mentioned that security would be on him instantly if he opened a soft box, so he used bounce flash, so that had me slightly concerned. I will have an assistant with me to hold any lighting, as I didn't have intentions of setting up tripods or any stands. I was hoping to use the Ez box on monopod real quick and be done with it. I did come across Rockefeller Centers website and it has a form for reaching out to them about film & photo. Not sure I need to go to that extent, but hopefully you kind folks can shed some light on the subject! Pun intended:) Thanks! I don't have specific advice. 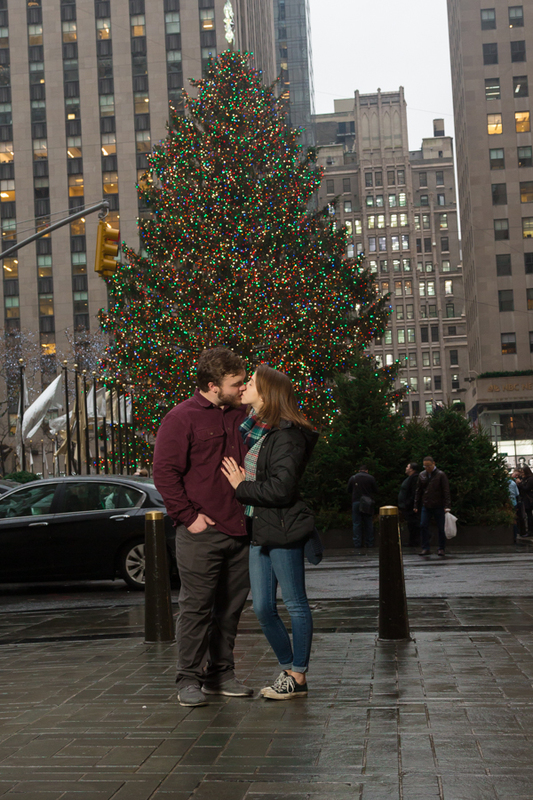 The crowds are quite significant at Rockefeller Plaza around Christmas (not sure if you have been there or not), particularly if you try to get close to the tree, so your couple won't be the only people in the photo. It's a good thing you aren't planning on a tripod or lightstand, because those would be impossible. What might work is getting a little bit further away. 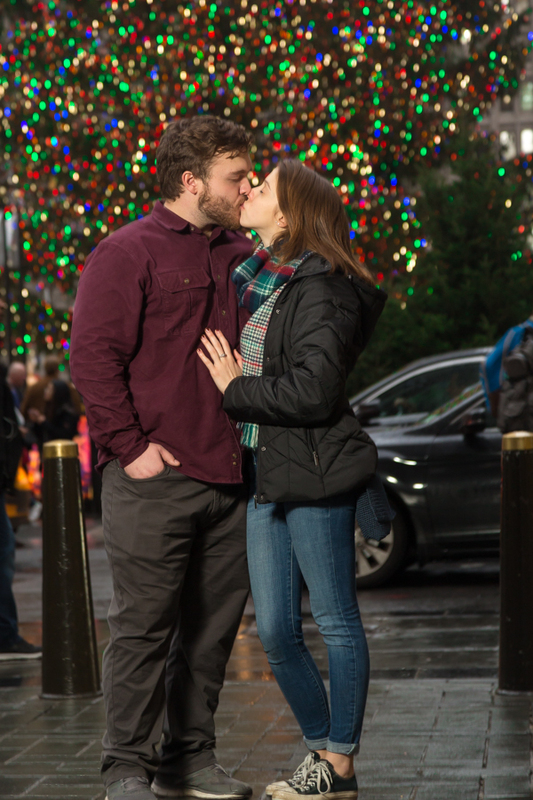 Perhaps across the rink from the tree, so the shot is the couple against the rail dead center with the tree and 30 Rock in the background. But even then, there are going to be people in the shot milling around holding shopping bags and taking photos and whatnot. And a mess of people waiting for you to get the heck out of the way so they can take their shot. It's just so busy down there this time of year. I'm curious whether you are doing this at night or during the day? I'm also curious if others chime in with experience here, and how it turns out. I hope you post the results! Good luck. Thank you Nikonguy. I had visited about 2 years ago and it was an absolute madhouse of people. I can't remember the vantage points all that well or the layout. The plan is shooting at dusk and its happening a day or two before Christmas, so I am hoping the crowds might have dwindled down by then a tad. I will post my results when its all said and done. The Rockefeller security guys will shut you down the moment they spot you. So work fast. Be ready and nail it from the start. However, the crowds will be insane. Personally, I'd go somewhere else where there is also a ton of lights - but less of a crush of people. 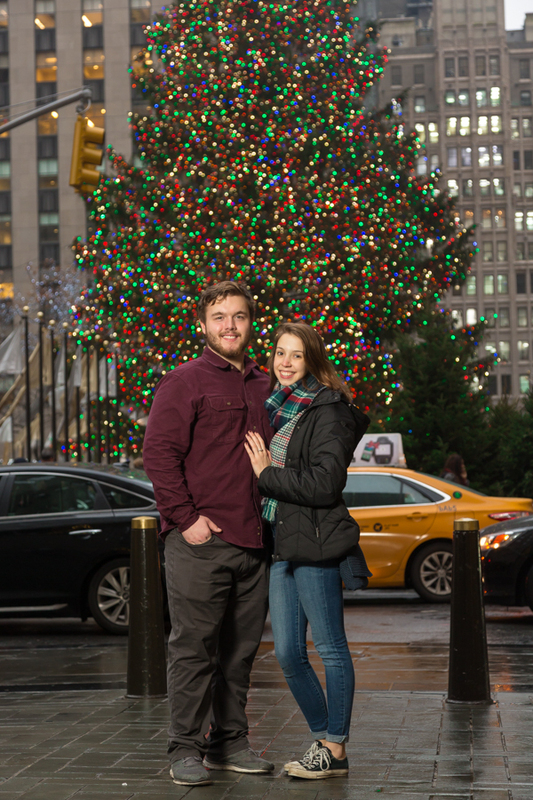 Scroll down in this post to see how I quickly photographed a couple at the Rockefeller center, as part of their elopement wedding coverage. How can they stop you? It's public property. Or are there sections of RC that are private property? Light stands, soft boxes, assistants, yada, yada, OK, impeding pedestrian traffic flow. But you, a client and a camera, you're no different from anyone else. Skipperlange, Rockefeller Plaza is not public property, it's private (which they open to the public). You're on their space when you're there. Tourists taking family photos, no problem. What appears like a professional photographer on a photoshoot? That's what might attract attention and I think that's what Neil is getting at. Ok NikonGuy, thank you. I always thought Rock Plaza was public but yes, makes sense if it's private. CanonJay, I was at Rockefeller Center yesterday. I took the attached photo around 5pm just to give a sense of the crowd. (Pardon the composition and image quality. This was at 24mm, 1/80, f/3.5 at ISO 6400. The crowd actually seemed lighter than I'm used to there, but it was relatively early in the evening I guess. To be honest, I didn't really see a good location for shooting but you probably could get lucky if your clients want a shot like this (them with the tree and the crowds). It would be easiest to use on camera flash for sure. PS.. My game plan is to have flash on camera and I will have a soft box folded on my assistant. He will have a monopod with a flash as his walking stick:) I will have two options at my disposal. If circumstances arise I will do a shot with the soft box, but if not then I have the trusty flash on camera. Yup, like NikonGuy showed there - there isn't really a clean open area you can take an uncluttered portrait. You would really have to make the crush of random strangers part of the portrait. This probably isn't ideal in a Where Is Waldo kinda way. I must agree Neil. I would like to be able to get a decent portrait without the clutter of a thousand plus people so I may have to rethink a strategy. My specific instructions from the client is that he wants a good portrait/portraits of themselves for the holiday and to meet them in Rockefeller Center. It is a surprise to her from her boyfriend. (It is not an engagement), and I just remembered that he has never been there, so I could possibly talk him out of it once he sees the crowds. I could be just assuming that the tree would be involved but I would bet thats what he had in mind though. However in some way this has become a personal challenge now:) I would like to succeed if possible. Maybe, if you were to ask some of the people around the couple to look at them and clap/smile, they could be 'part' of the shot, but not an obstructive part. Just a thought, depends on what sort of shot the client is actually after. Not a bad idea Trev for an up close and personal shot. Thanks! I also wonder if it is possible to incorporate a shot from a distance away? If I am not mistaken there is a ice rink or something on one side? Maybe I can go way out and shoot from there getting some of the tree in. At this point I am just guessing and I think it boils down to crowds, vantage points on that day and just winging it. If you could get a distance away, it would be a lot less cluttered and with a wide aperture have the people out of focus more and get more of the tree in for sure, that should work well actually. Even a 100 meters away, use a 70-200 to pull them in and tree in background. 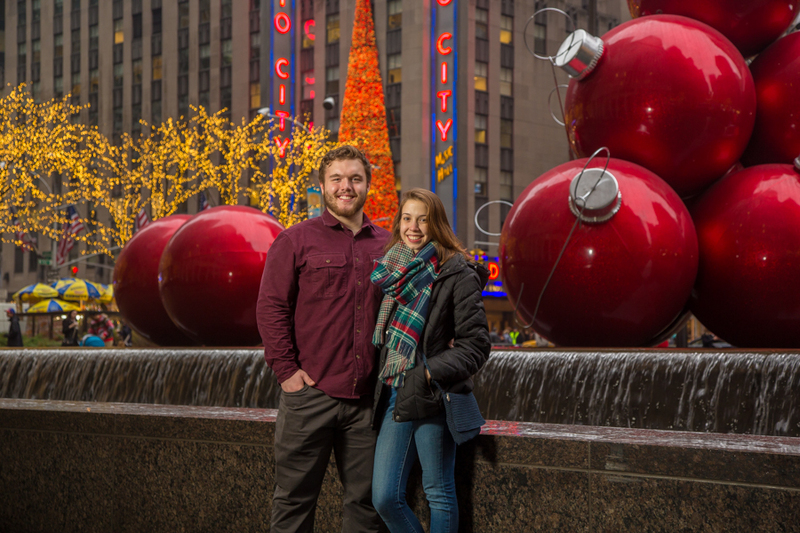 Just a few blocks away, across from Radio City Music Hall, are those red holiday seasons balls ... they'd make an interesting and relevant backdrop? Thanks Neil! That is perfect! It incorporates Christmas and the city feel. Is that a photography friendly area or do I have to avoid any photo scrooges? That area is busy, but not nearly as jammed as the Rockefeller Center. I would like to take this opportunity and thank everyone for taking the time to help me. As promised, I have posted a couple from the session here for feedback. I did a quick edit but if anyone has any ideas that would be great. Thanks again! I think you did a really nice job! I especially like the first two -- on the side of Time & Life building. I might crop the other three down a bit? Or do you want more of a sense of the city? I was there a few days ago (Christmas eve) and, as you may've found also, I couldn't even get near the ice rink. Never seen so many people. Fifth Avenue was difficult to navigate it was so crowded. Walked one block over to Madison and there was almost no one. This was in the evening. Thank you Skipperlange! I was there on the 23rd and it was busy of course. The weather was not so good and we were scheduled to meet up at 4 but decided to move the timeline up to 2 because the rain was getting heavier by the minute. It was a double edged sword. I had to fight the weather but the crowds were not as bad. Getting out of the city was horrible, but all in all I am happy with what I was able to get! Most importantly the couple and the parents were happy! Ps...I do have closer shots of both scenes as to cover all aspects. I personally like the closer isolated ones, but since this was the first time the couple has ever been there I was sure to include the city feel for them. Hey, nice! Thanks for sharing these - I was wondering how they would turn out. Crop appears a little tight on a couple of them (cutting off fingers in one, shoes in another) and the last one could use some straightening. They look good though considering the weather and crowds. Glad to hear the clients liked them. I thought you did a good job Jay, and my only comments reflect Nikonguy's. Well done. They turned out neat. Nice use of off-camera flash too. Thank you Trev & Neil! Much appreciated.